My cousin and I began discussing ramping up our attendance at Stars games. More games meant the need to expand my Stars wardrobe. I only had a blank white home jersey and was looking at buying a road black. The black jerseys did not look as good blank, as the white so the question came up of who would I get put on mine. I had already seen a few friends of mine get burned by trades just after having purchased that players jersey. I decided to have my name put on it. After all the Stars couldn’t trade me. I picked the number 25 because it was my favorite number that wasn’t taken. I ordered it by mail through a holiday promotion the Stars were having. It was due to arrive in the middle of December. December 15, 1995 a package was dropped off at my neighbor’s house. I raced over and verified it was indeed my new game day sweater. I was so excited and could not wait to wear it to Reunion Arena. December 19, 1995 the Stars acquired Joe Nieuwendyk from the Calgary Flames. My cousin Bryan was the first to call me and give me the news. I said, “Don’t tell me.”, He said, “Yep.” My cousin and I have that ability to have full conversations in a handful of words. In that one word I knew Joe had taken my number. I laughed, moved on, and thought that the story would end there. June 19-20, 1999 Joe Nieuwendyk and the Stars live up their end of the bargain by defeating the Buffalo Sabres in the third overtime of game six of the Stanley Cup Finals. Adding an exclamation point to our deal, Joe Nieuwendyk took the Conn Smythe Trophy as the playoffs most valuable player. After celebrating the Cup victory I honored my end and removed my jersey for the last time. It has since been framed and hung on my wall. 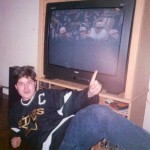 This is Part 2 of a three part series about the 1998 Playoffs and “The Best Game I Ever Missed”. See below for Part 1 and watch for Part 3 to come on April 12th, 2013. 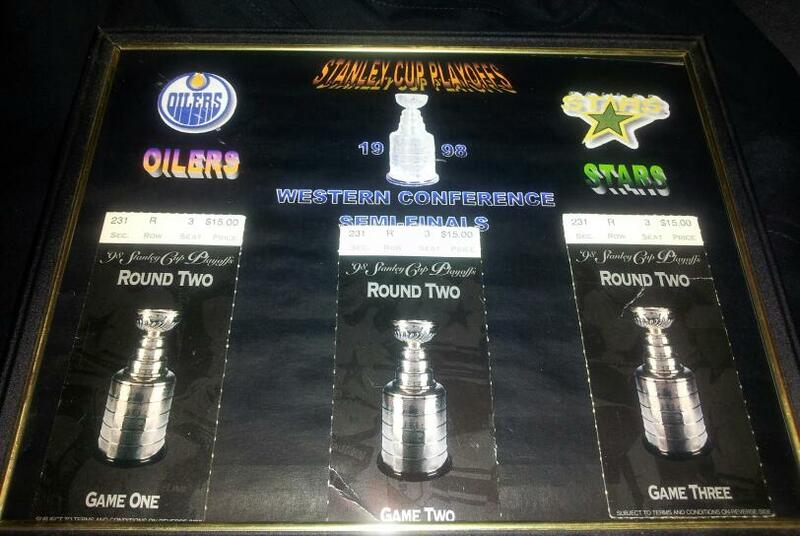 The Edmonton Oilers shocked the Stars in seven games in 1997. This would be my chance to finally shake off those feelings from that series. A 3-1 victory was just what I needed to calm my nerves just a bit, but I knew this series was far from over. Game two brought an act of defiance on my part for I was going to prove superstition wrong. Confident in my Stars I defiantly refused to paint my face. Those who follow superstition enslave themselves to coincidence. I was determined not to let this be my fate. I rolled the dice and lost as my team could not even get one, past Curtis Joseph in a 2-0 loss. After that game I was made to promise that I would not go another playoff game without my war paint. We returned the favor in-game 3 in a 1-0 shutout in Edmonton. Game four brought another hockey experience that added another dimension to the game. The Stars announced that at the Stars Center in Euless there would be a game watching party. There we would be able to cheer on our Stars when they were on the road. This was a pivotal game and we could use the support of fellow fans like us. The experience of a crowded room full of strangers, feeling the same intense emotions as me was intoxicating. I couldn’t get enough. The score and momentum went back and forth all game long. We went through every imaginable emotion during that game. When the game ended in a 3-2 Stars victory the room had gone from crowded to cozy and there wasn’t a stranger in the room. You meet your hockey friends at games or online, but at watching parties your Stars friends become Stars family. That is where you truly get to know each other and that was the lesson I was beginning to learn. 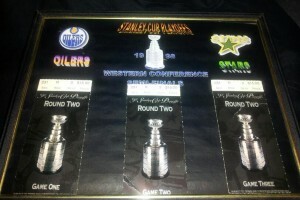 The next game was just as close as the rest and just as intense as the Stars closed out the Oilers at home. I was finally able to see a series won in person and to be on the happy side of the handshaking ceremony. If you want to be the best you have to beat the best. Up next the defending Stanley Cup Champions.